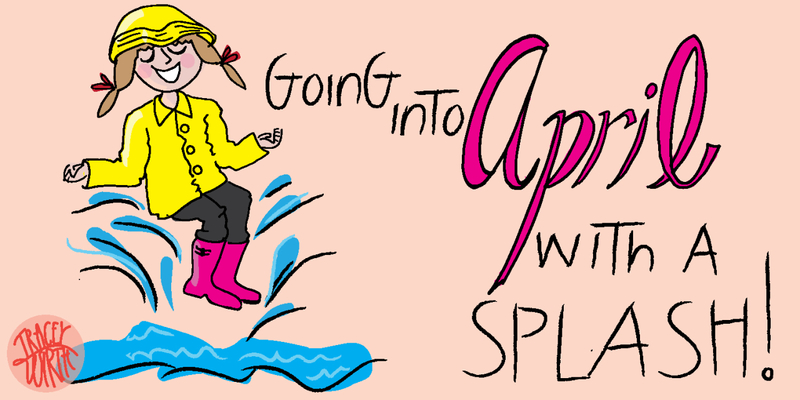 Going into April with a SPLASH! Each month I like to show some of my new artwork. This month will not be an exception, but like most of my work it is inspired by something from my childhood. Growing up in Michigan I realize that it’s the small things that really matter. Sometimes the simpler the better too! The memories of “puddle jumping” came flooding back (oh gee pardon the pun, it really was an accident). Like those times my sister and I were allowed to go outside and jump in the puddles. My mom would give us the freedom to run around in the rain, if 3 conditions were met. First of all it had to be a warm day. Second, it had to be during the day. And thirdly, under no circumstances could there be lightning or thunder. Thank goodness for a cautious mother, or I might not be here! Or, maybe I would have that curly hair I always wanted? Hmmmmm… Anyway continuing on with my little story. Puddle jumping out in the country was more like MUD puddle jumping. Our driveway was dirt, and the many streams of rainwater would merge perfectly, creating the deepest darkest nooks and crannys for mud puddles, and a haven for kids to splash into. Oh those were the days. If only I still liked to get dirty! Darn, I hate being a grown up sometimes! How about some raincoat artwork to go with that memory? We were so “old school” back then that we didn’t even wear raincoats or boots! WE would run around bare footed and let the mud squish between our toes! They build ’em tough in Michigan! 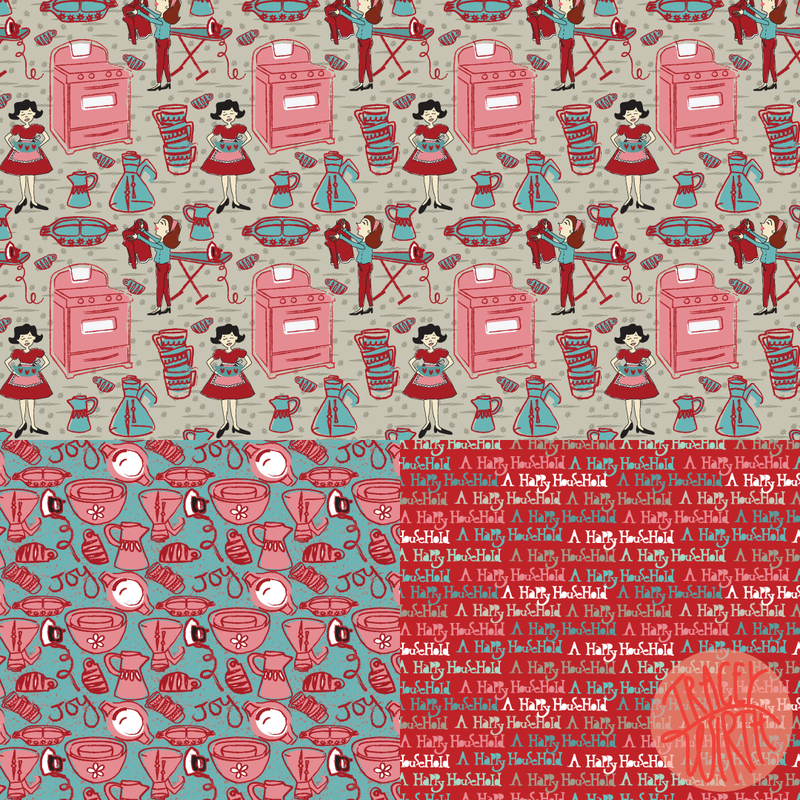 I released another colorway (red) for my “A Happy Household” fabric collection on Spoonflower. It seems to have created some kind of a “stir”. Oh no, I made another pun, really, I cannot help it!!! These designs are getting a lot of love on Instagram, Facebook and Pinterest and for me it’s been a real kick! Because I don’t really believe that this is the way of the modern household. NO SIREE! I mean just ask my husband – he does way more laundry than me! In my opinion “A Happy Household” is a household where all those tasks are shared. So this is meant to be fun, no judgement here! 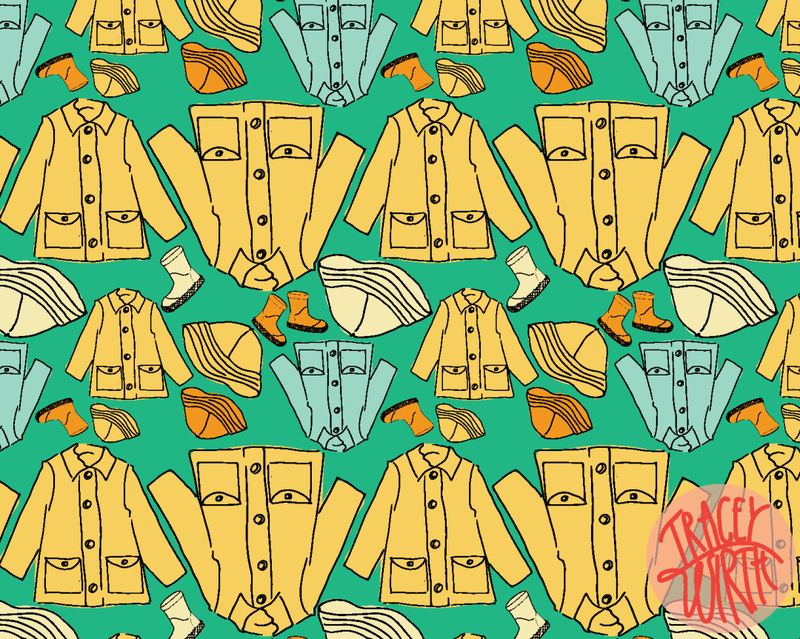 There is a link on my website for Spoonflower at the top menu where you can access my Spoonflower shop. In addition to these designs, there are many more to be discovered! What can I make out of “A Happy Household” fabric designs? Well, so funny you should ask. I have a few mock-ups to share! 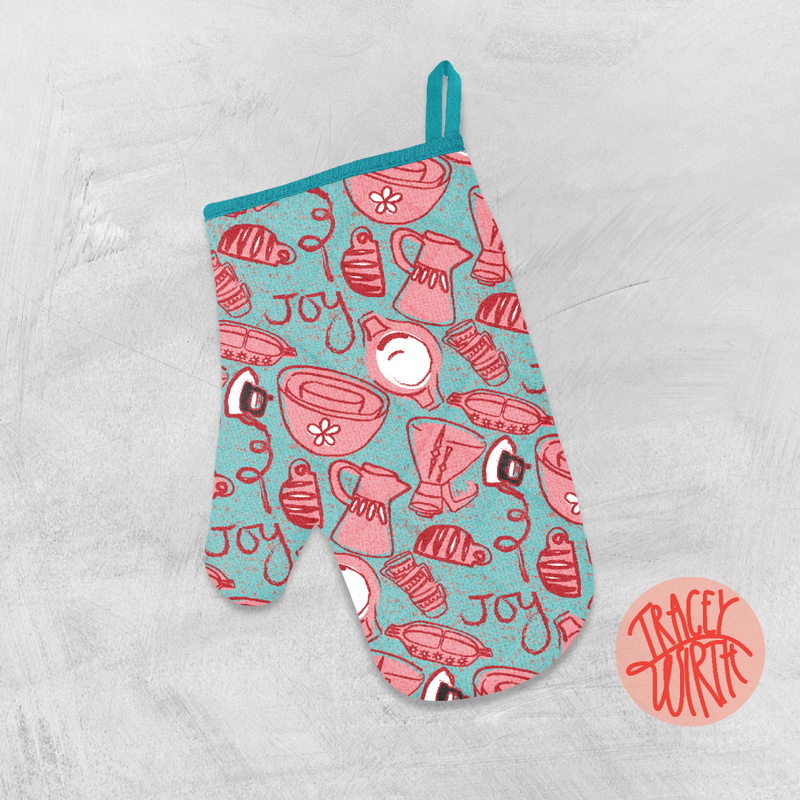 How about sewing up an oven mit in the “Joy of Baking” print! 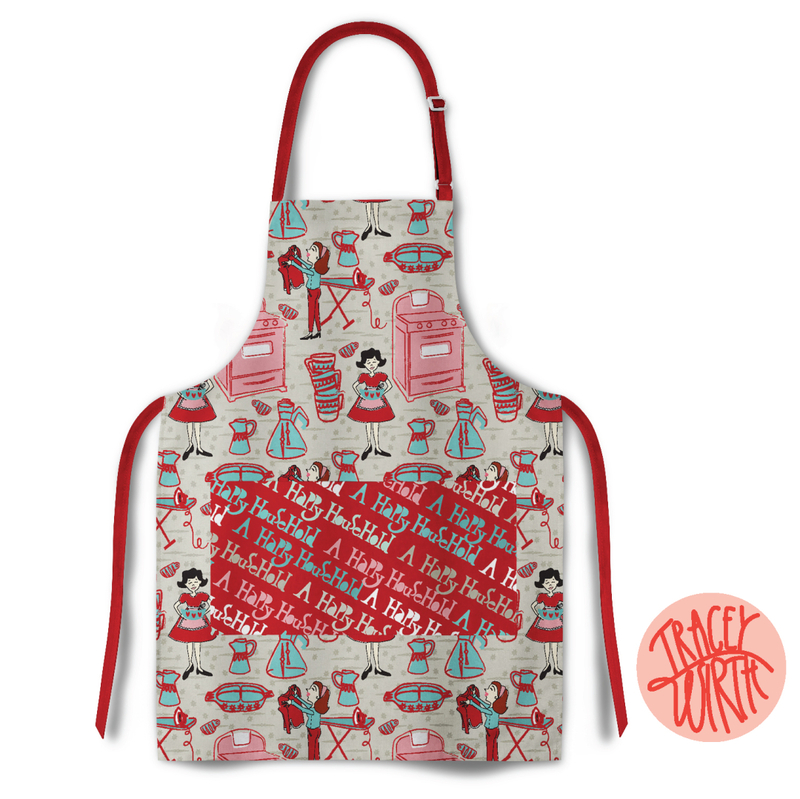 What if you were to create a snazzy apron for a Father’s Day or Mother’s Day gift? See there is no judging here! I told you! Both may be used by any gender. My creative juices have been flowing, and I have been preparing all sorts of designs for all surfaces, which will only be revealed at SURTEX, which takes place May 21st-23rd at the Javitz Center in New York City. Those of you that recieve this newsletter AND are in fact looking for new designs that will be available for all kinds of surfaces should certainly stop by Booth 2823. My agent Sue, from Vivid Art Agency will be there representing me, and I would love to meet you as well. If you don’t see what you need, let’s talk about it and I’ll create something you really love. All my contact information is at the bottom my newsletter and I would love to hear from you!! I’ve joined an instagram movement, The 100 Day Project. This project is meant for creatives to spend up to 10 minutes a day creating something you wouldn’t normally make time for. I have decided on painting with watercolors. My theme will be flowers and with a goal of 100 consecutive days, hopefully this creative journey will result in some great artwork and a refreshed confidence in this medium. Join me on this journey. It starts today and I will be posting to instagram once each day for this challenge under my unique hashtag #the100DayProjectTraceywirthdesigns. As always, thank you so much for reading my newsletter. It’s a real honor to interrupt your morning routine with a little light, fun, and sometimes humorous artwork. Thanks for allowing me to be part of your day! Have a great month, and I’ll see you in May!